New York Giants defensive tackle A.J. Francis says agents from the Transportation Safety Administration spilled his late mother’s ashes in his suitcase during an inspection of checked luggage before a flight. On Monday morning, Francis tweeted about his frustration with the TSA, along with a photo showing the ashes scattered on items of clothing inside his luggage. The photo included a flyer from the TSA informing Francis that his luggage was among the pieces of checked luggage that was inspected by agents. He continued to tweet about the incident, saying he has no problem with the TSA checking his bag, but said the agents were “Irresponsible” when handling the urn that held his mother’s ashes. The TSA apologized to Francis on Twitter, replying with a link to file a formal complaint. CBS News reached out the TSA for further comment, but didn’t immediately hear back. Francis joined the Giants in May after playing for several NFL teams, including the Washington Redskins and Seattle Seahawks. Having to cope with losing a parent is hard enough, but having to deal with a mishandling of their ashes is something that no child should have to deal with. Unfortunately for New York Giants tackle A.J. Francis, that’s the nightmare he was faced with this week after traveling with his recently-deceased mother’s ashes in his luggage. 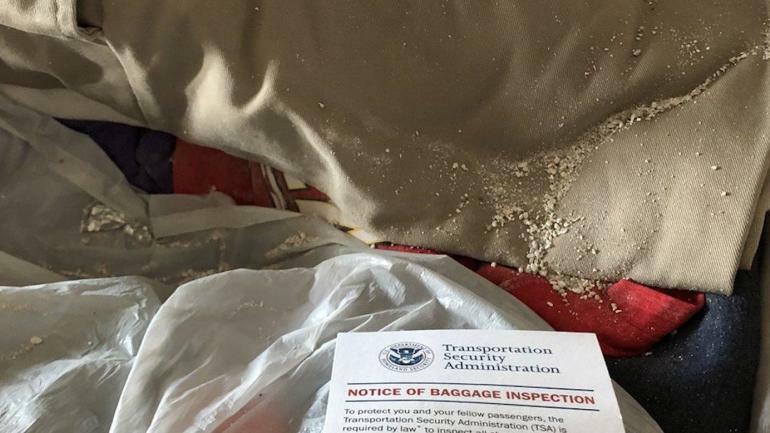 The 28-year-old opened his suitcase to find those ashes spilled on his clothes with a notice of inspection from TSA. Francis took to Twitter to call out TSA, and – as you’d imagine, he was pretty furious. In most cases, travelers carrying cremated remains are allowed to bring the ashes on both carry-on and checked luggage, as long as they’re transported in a permissible container. According to TSA, agents are instructed to not open a container with cremated remains under any circumstances, even if requested by a passenger. When Francis filed his complaint on social media, the administration’s customer service account responded offering an apology and condolences. The tackle followed up by clarifying his anger on the issue. New York Giants player A.J. Francis is railing against the Transportation Security Administration, alleging agents who conducted an inspection of his checked luggage opened and spilled a container carrying the cremated remains of his recently-deceased mother. Francis, a defensive tackle who played for the Washington Redskins until earlier this year, shared a photo via Twitter on Monday morning that showed the contents of his luggage after the bag inspection – including loose material that appeared to be cremated remains, along with the generic “Notice of baggage inspection” from TSA. The tweet does not say specify where the inspection occurred, and Francis could not immediately be reached for comment. A TSA spokeswoman said Monday afternoon that they have not received a direct response from Francis with more information about the incident. “If Mr. Francis provides us with his flight information, videotape review can help determine what condition the contents of the checked bag were in while it was in TSA’s possession,” the spokeswoman said. “Videotape would help determine the condition of the contents of the bag at the time a TSA officer opened it; review what steps a TSA officer took upon inspecting it; and determine the condition the contents were in when the TSA officer closed the bag,” the spokesperson added. According to policies outlined on TSA’s website, security screeners for the agency are instructed never to open cremated remains, either in a carry-on bag or in checked luggage. As part of their instructions to passengers, TSA advises travelers carrying cremated remains put them in a temporary or permanent container that will not flag special scrutiny from bag screeners, such as a canister or capsule made of lightweight wood or plastic.